Growing crops in salt water is becoming necessary to overcome shortages of fresh water, say researchers writing in the journal Science. They suggest the domestication of wild plants that grow in salty conditions could help reduce global food shortages. Only 1% of the Earth's water is freshwater. Around the world, many agricultural areas are becoming less productive as salt levels in water supplies increase. "Salinisation is irreversible," says Professor Jelte Rozema from the department of systems ecology at the Free University, Amsterdam, in the Netherlands. "Sooner or later mankind has to accept the world is becoming more saline." 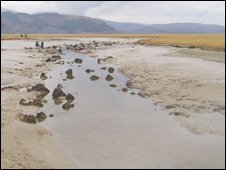 The scientists say we will have to make use of salty environments for agriculture. Farmland is becoming increasingly salty as global sea levels rise, but plants which already thrive in salty areas may provide a ready food source. Future crops could come from plant species that grow in brackish water, around the mouths of rivers, where salt and freshwater mix, say the researchers. The rising cost of bringing in freshwater to irrigate traditional crops may force producers to turn to salt water agriculture. "We have limited amounts of freshwater - most of it is used for drinking water. Gradually it will be profitable to think of brackish water and sea water as a resource." said Professor Rozema. The scientists suggest the best way forward is to domesticate wild plants, crossbreeding them to produce higher yields. Plants such as sea kale and asparagus-like samphire, which grow along the coast in many countries have been eaten for thousands of years, but it is only recently that their potential has been seen as a substitute for more traditional commercial crops. In The Netherlands sea kale is now farmed commercially and finds a ready market says Professor Rozema. "There's a company cultivating it on shingle beaches, its a big success in the Netherlands, people like to get new vegetables, they know sea water is not bad for them." The researchers say plant breeders also need to look at domesticated plants that are salt tolerant, spinach and beetroot are closely related to samphire, and crops such as sugar beet can grow well in salty conditions. 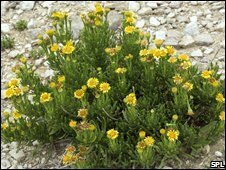 "Its a salt tolerant plant, this salt tolerance has not been reduced during domestication." said Professor Rozema. Genetic modification experiments have been conducted for more than 30 years to try to make crops such as wheat or rice salt tolerant. But the scientists say trying to induce salt tolerance has so far proved impossible. They now believe the genetic manipulations necessary to achieve this may too complex to be achieved at present. The researchers also say some species of plants currently growing in salty environments could have a future use as biofuels. 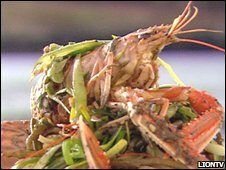 They cite one particular type of samphire, the seeds of which produce more oil than soya beans or sunflowers. The plant grows well on subtropical desert coasts. Can GM save the world?